Besides Japan and South Korea, many countries in Europe and the Middle East have shown interests in hiring Vietnamese workers. Vietnam sent 421,860 workers abroad last year, 30% higher than the set goal and 7% higher than 2017's. Up to 68,737 workers were sent to Japan, 60,369 workers went to Taiwan, 6,538 went to South Korea and 1,920 went to Rumania. The rest went to Malaysia, Algeria, Kuwait, Macao and Singapore. 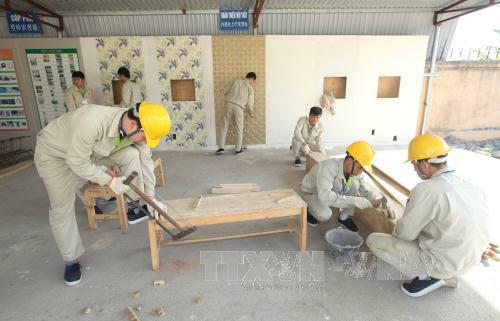 The Ministry of Labour, Invalids and Social Affairs had implemented several measures to improve vocational skills and foreign languages to make workers more competitive. They also carried out spot inspection at labour companies and collected VND430m (USD18,500) in fines. According to the Overseas Labour Management Department, many big markets including Taiwan, Japan and South Korea still have high demand for Vietnamese workers. Several markets in the EU such as Bulgaria and Rumania have also shown positive signs. Demands for foreign workers in Japan increased in various industries. Vietnam can also meet demand in nusing, farming and as technicians. Besides efforts from the local authorities, labour firms are being proactive in finding new opportunities overseas and have invested more in vocational training courses. In 2019, Vietnam expects to send 120,000 workers abroad. A new year has come with more opportunities as several countries in Eastern Europe and the Middle East have shown interests in hiring Vietnamese workers. Vietnam has the opportunity to send 50,000 people to Bulgaria to work in construction, textiles, hi-tech agriculture, and hospitals. Workers for Rumania don't have to pay high fees and can earn a monthly wage of USD600 to USD1,200. Nguyen Gia Liem, deputy head of the Overseas Labour Management Department, said they had received many complaints by workers who had been affected by absconding cases. "The demand to work overseas to support families is legitimate but taking advantage of tourist and student visas to abscond in another country is illegal and no one will be protected," he said. The department has asked related agencies to publicise information about licensed labour firms. They also launched a programme to raise awareness of the locals and asked firms to review the attitude of workers before sending them abroad. They will work with labour firms in order to minimise fees that the people have to pay to travel abroad. The Overseas Labour Management Department will continue completing the legal framework and submit the revised law on sending Vietnamese workers to overseas markets to the National Assembly in 2020.